Few films have such a hold on my affections as this one. It is a work of supreme humanism, about a doctor whose purpose in life is to ‘make sick people well’. What’s more, it carries with it overtones about the roles of women, morality, abortion, the death penalty, the communist witch-hunts of the 40s and 50s, and unfettered capitalism, among other things. 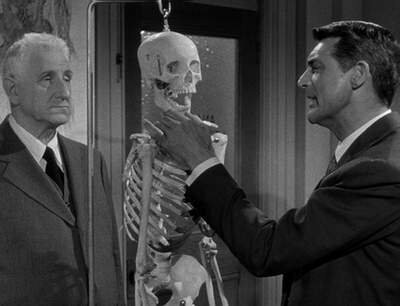 The fact that it was made by a major studio in 1951 speaks to the remarkable nature of the film. So why don’t more people know, and talk, about People Will Talk? 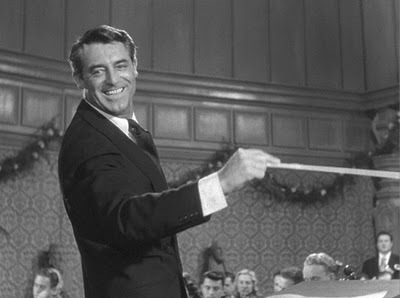 It is not Cary Grant’s most iconic role, but it very well should be. Grant plays Noah Praetorius, a doctor who teaches at a university and runs a clinic based on the notion that it is the job of a doctor to cure the sick in whatever way possible, holistically and otherwise. 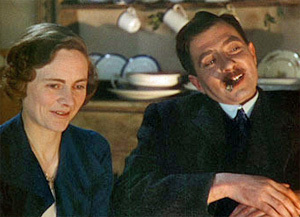 The first section of the film focuses on Praetorius’s relationship with his friends Shunderson (Finlay Currie, in a role that should have received an Oscar nod) and Professor Barker (Walter Slezak), his rival at the university Professor Elwell (Hume Cronyn, as mean a little wretch as ever committed to film), and his growing relationship with Deborah (Jeanne Crain), a medical student, eventual patient and unwed mother. The relationship between Praetorius and Deborah occupies most of the first half as the film, as Deborah discovers that she’s pregnant by a former flyboy now dead. She’s checked into Praetorius’s clinic again after she attempts to kill herself, ashamed and terrified of informing her father, whom she insists it will ‘kill’ to know that his daughter is having a baby out of wedlock. The film addresses the issue of the pregnancy with beautiful humanity. There is no moralizing – as far as Praetorius can see there is nothing for Deborah to be ashamed of – and no punishment in store for the young woman. She is not even really afraid of being rejected by her father; her fears are more founded on his dedication to her and his dependence on her. Even her suicide attempt is not a serious one. The pregnancy is treated with an equal amount of frankness and delicacy. When Praetorius finally proposes marriage, as we knew he would, he does so not because he feels sorry for her or because he wants to “save” her. He’s fallen in love with her. Praetorius’s conflict with Professor Elwell takes up the second half of the film. Elwell has spent much of his early scenes trying to discredit Praetorius as a teacher and a doctor, ultimately lighting on the curious relationship between Praetorius and Shunderson, his friend and helper. The trial sequence takes place on the night of a concert Praetorius is supposed to be conducting. As Praetorius deftly turns away each of Elwell’s accusations – that he’s a charlatan, a poor doctor, etc. – he exposes the hypocrisy of the whole process. Elwell’s accusations are hearsay and implications, all tending to try to discredit Praetorius without necessarily settling on anything that is illegal or actionable. While I won’t go into details about the final revelations about Shunderson, to whom Praetorius is intensely dedicated throughout the film, the conclusion is lovely and affecting. People Will Talk raises so many interesting issues with such gentle humanity that it’s difficult to pick on any one element. The trial sequence at the end is meant to mirror the witch-hunts of the Hollywood blacklist, depending as it does on vague implications but no real crime. Which brings the whole film back around to its title. 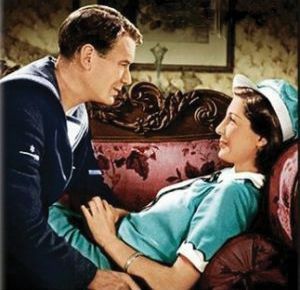 From Deborah’s pregnancy, which is not criminal but somehow morally wrong in the eyes of 1950s society, to Shunderson and Praetorius’s relationship, and finally to Elwell’s insinuations about Praetorius’s capabilities as a doctor, the entire film is structured around what is not spoken, what must be implied in order to condemn a person. But in each case, it is humanity that triumphs. Deborah has not committed a crime, she is not punished for it, she’s rather rewarded in the person of a loving husband and devoted father. Praetorius is an immensely capable doctor, superior to Elwell in his abilities but also in his compassion. The film celebrates compassion and love over propriety and hypocrisy. And it does so without ever becoming maudlin or melodramatic. The cast is uniformly superb. Grant’s biggest challenge in some ways is to keep Praetorius from looking too much like a saint, but he keeps an unearthly man firmly grounded; he’s a boy that plays with trains as well as a kind and dedicated doctor. He’s a man capable of passion as well as compassion for his future wife. Grant’s humor keeps him from floating into the stratosphere; Praetorius never ascends to the height of a saint. Praetorius does not exist, but he really should. 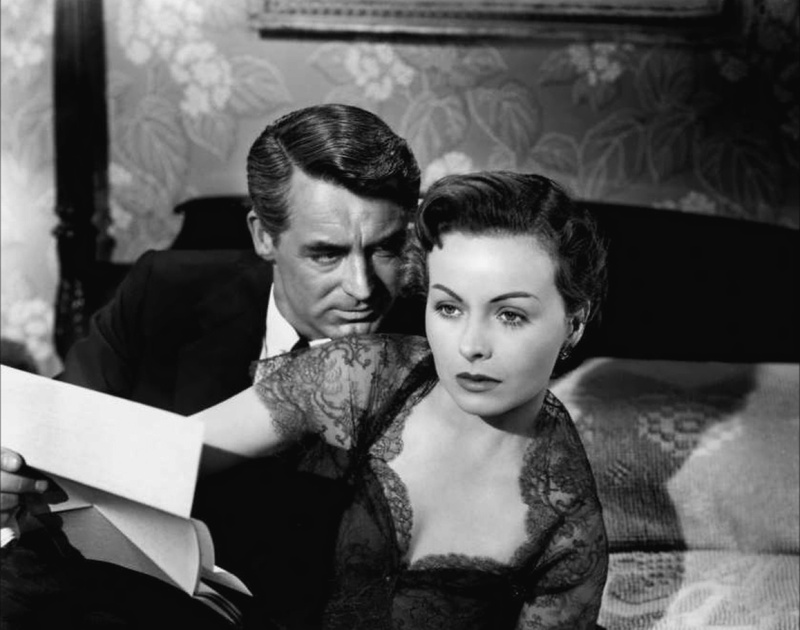 Jeanne Crain likewise gives an excellent, difficult performance, never slipping into sentimentality. Deborah’s great dilemma is about her unborn child, her relationship with her father and her eventual love for Praetorius, but she is a full, rounded character. She gives a human account of her relationship with the child’s father, of her reasons for loving him as well as her reasons for falling in love with Praetorius. She’s believable as both the frightened young mother in a difficult situation, and as the somewhat strong-willed woman who runs away from a clinic in the middle of the night. I do however give the edge to Finlay Currie as Shunderson. He’s a large, lumbering man of exceptional gentility, quietly stealing every scene he’s in. His final story at the trial, when he reveals how he came to know Praetorius, is at once hilarious and moving. He’s an unknown factor in the film, a lover of animals whose dedication to his friend is equalled only by his absolute love for him. Filmmakers would do well to take a cue from People Will Talk. There are few films capable of such humanism, such gentleness and frankness. There is no preaching, no moralizing, no retribution and no posturing. Too often films attempt to get their message across by beating you over the head with it. This film attempts to get its message across by appealing to basic decency and humanity, by giving the viewer the opportunity to recognize that there are ways to live beyond the narrow strictures of proper society. The point that it makes is that people will talk no matter what; what we need to learn is how to live our lives independent of what they say. Kindness, love, humanity; these are the things that really matter. All the rest is just needless gossip. I firmly believe that if you don’t like Charlie Chaplin you have no soul. 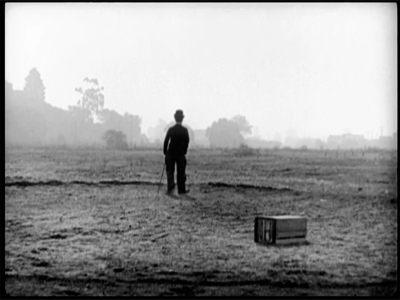 How anyone can sit through City Lights or Modern Times and not fall in love with the Little Tramp is beyond me. Even if you don’t particularly like silent films, Chaplin must be able to melt your cold, cold heart. The Circus is one of the lesser known of Chaplin’s feature-length films. Made in 1928, at the height of his popularity, it’s a short, sweet film about the Tramp joining up with a circus. It does not have the pathos of City Lights and The Kid or the social commentary of Modern Times. What it does have, and this in abundance, is comedy. The plot is simple enough. Down at the heels as always, the Tramp (Chaplin) blunders into a job with a traveling circus when he accidentally gets more laughs than the clowns. There’s a girl (Merna Kennedy) being bullied by her ringmaster father (Allan Garcia), which naturally raises the Tramp’s hackles. 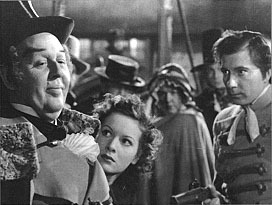 Then there’s the competitor for her affections in a tall, dark and handsome tight-rope walker (Harry Crocker). But the plot is really incidental and largely exists to move the Tramp from one comic situation to another. Which is largely the point. 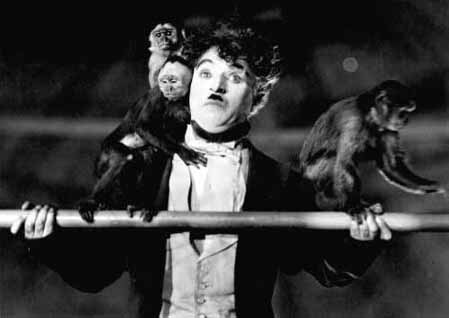 More so than any other Chaplin film, The Circus is an expression of pure comedy. Its very subject matter is comedy. The Tramp gets his job with the circus when he’s chased by a police officer into the big top. He’s running for his life and his freedom, but the circus audience laughs harder at the improvised comedy than at the professional clowns. His next big hit comes when he’s employed as a prop man, chased by an angry donkey and pitches into a barrel. Then, without intending to, he ruins a magician’s performance by revealing every trick. As the Tramp dashes around trying to capture the wayward animals that spring the magician’s hats, the audience behind him howls with laughter. He’s a hit, but he’s oblivious. When the Tramp attempts to be funny, he fails. But when he’s actually in danger, or in pain, the audience goes into hysterics. His real life is a comedy. For some reason, I’ve never thought of Chaplin as an acrobat. Most of his films don’t place as much emphasis on high-flying tricks. In The Circus, his acrobatics give Buster Keaton a run for his money. One of the most spectacular, hilarious set-pieces takes place on the high-wire, when the Tramp takes over for the missing tight-rope walker. As the routine falls spectacularly to pieces, the Tramp loses his belay and is chased across the wire by monkeys. He’s in great physical danger and it’s funnier than hell. He was also quite a spectacular filmmaker. He’s the definition of an auteur — wrote, directed, starred in and sometimes even scored his own films. And his use of the cinematic medium is flawless. When the Tramp runs into a funhouse hall of mirrors to escape the police, the spectacle of cinema comes into play. 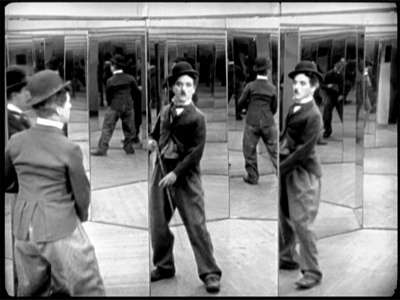 The Tramp begins to lose himself in the myriad reflections, chasing after his hat in the mirrors. He comes to understand the mirrors, though, and when he’s caught, it is the Tramp that has to show the police officer the way out. He becomes the manipulator of the image; the filmmaker. Chaplin often had a tinge of melancholy in his work, and The Circus brings it into very sharp relief. While we laugh at his antics — and they are very, very funny — there is always a sense of sadness in the Tramp. He’s poor, he’s destitute, he’s basically a decent man who cannot catch a break. His comedy comes from poverty and danger. Even when he becomes a star, the villainous ringmaster keeps him in the dark about his popularity. He’s treated as a prop man, not a performer, and bullied by everyone. Even his relationship with the girl is doomed. He protects her from her father, feeds her when she’s hungry, and treats her decently as no one does. But she’s not in love with him; she’s in love with the tight-rope walker and looks on the poor Tramp as just a friend. That does nothing to diminish the comedy in The Circus; it rather enhances it. Chaplin’s great talent was taking serious subjects — poverty, unemployment, starvation, abuse — and making them funny. He turns obtaining food into a juggling act, running from the police into a comic chase. He steals a hot dog from a child, is chased by a donkey and bit by monkeys. It’s all a funhouse game, an elaborate magic trick. It’s turning tragedy into comedy. The Circus is entertaining because it’s funny, but it is a great film because it is melancholy. Chaplin takes comedy very seriously, and it shows. He’s more than willing to put himself in danger for laugh — at one point, he climbs into a sleeping lion’s cage and the terror on his face is quite real. And the subject of The Circus is exactly how far a performer will go for the pleasure of the audience. The Tramp is not a naif; by the end of the film, he’s aware that he’s been exploited, mistreated and manipulated. But that’s all right, because he did it all to make the girl (and us) smile. Chaplin’s films often end with an uncertain future. In Modern Times, the Tramp and the girl are still destitute, still jobless and still running from the authorities. The war and the Holocaust have not ended in The Great Dictator. Even The Gold Rush draws the future happiness of its protagonist into question. Yet no one would call Chaplin’s work pessimistic. His great sensibility is that, no matter what, the little Tramp will still carry on. Strange, quiet, gentle and gentlemanly, he might be poor, he might be starving, but he will still pick himself up and walk onwards, into the sunset. At the end of The Circus, alone in the circle of the big top, he collects himself and wanders off. Where he goes is anyone’s guess, but you still have the sense that he’s out there, always ready to help the innocent child, the frightened young woman. Always ready to make us laugh, even if he feels a bit like crying. I do enjoy British domestic dramas. While British post-war films have been duly celebrated, not enough is said about the films made in Britain in the 1930s and 40s, as though British cinema began with the decline and fall of the original studios. What makes This Happy Breed an interesting product is that it is a war movie without being a war movie. Which might sound inexpressibly dull, so I’ll point out that this was written by Noel Coward and directed by David Lean (of Lawrence of Arabia, you’ll remember). I am not a huge Coward fan. His work typically prizes a spirit of conservatism, even mediocrity, and he’s the last writer in the world I’d expect to speak convincingly about the trials and tribulations of a lower middle class family. So I was surprised by how affecting This Happy Breed proved to be. The plot is simple: it follows a working class (ish, they seem to have one servant and lots of leisure time) English family twenty years, from 1919-1939. 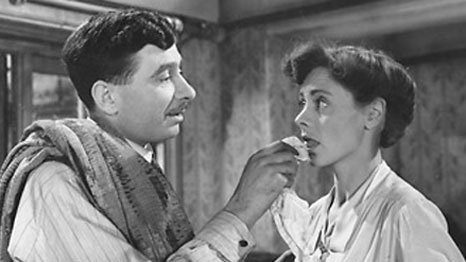 The husband Frank (Robert Newton, proving just how good an actor he really was) has returned from the First World War and moves into a new home with his wife Ethel (Celia Johnson) and three children (Kay Walsh, Eileen Erskine and John Blythe). What follows are the difficulties of post-war life, the problems of raising children, the shifting politics and changing landscape of Britain, seen through the eyes of some very indomitable English people. The script, originally a stage play, has been accused of being condescending … and to a certain extent, it is. The Gibbons are a conservative lot, preaching family values and unquestioning of the class system; very much an upper class attitude about the way the lower classes are supposed to behave. Some of the more difficult sequences involve the son Reg who gets involved in Socialist politics, much to the chagrin of his father. And the film fails, for the most part, to present the issues at stake with any sort of complexity. Reg is wrong and his father is right, but aside from a rather heavy-handed speech by Daddy, there’s not much convincing being done. More complicated is the ‘downfall’ of the daughter Queenie. She runs off with a married man, rejecting her family’s class status, moralism, and the life they have built, and condemning herself into the bargain. This is dealt with in much more detail and with more breadth of character, presenting the parents’ differing reactions. Sexual politics is a complicated issue and the film deals with it in a remarkably nuanced manner. The film is helped along by the exceptional abilities of David Lean, in his first major assignment as director. His style is already much in evidence. For a director who would later be known for the dramatic scope of his productions (Bridge on the River Kwai, Lawrence of Arabia, Dr. Zhivago and so forth), Lean does a lot in a very confined space. Most of the film takes place within the four walls and back garden of the Gibbons’ house. The camera moves effortlessly through the rooms, making them at once cramped and home-y. This is a family that lives on top of each other but manages to do so without claustrophobia. Nearing the end of the film, Ethel remarks that ‘this room looked much bigger with things in it’; and it does. Lean’s non-intrusive but powerful cinematography gives the viewer the sense of having actually lived with these people, rather than observing them on a stage. He makes what could have been a very stagey production come alive. A lot of credit goes to the cast, which reads as a who’s who of British character actors: Robert Newton (yes, I do have a thing for him) and Celia Johnson are the parents, Kay Walsh the discontented daughter, John Mills the boy next door, and Stanley Holloway the war vet and neighbor. Newton and Johnson are the anchors here, playing Frank and Ethel Gibbons as a quiet, determined couple. They play off each other admirably; one has the sense that these are two people who have been together for a very long time. Newton’s Frank is a perfect patriarch, loving, understanding, but uncompromising in his views. He’s a sensitive figure, breaking into tears and laughter as the situation demands, but never losing his dignity. He loves his wife and children without being demonstrative. Few actors could deliver a speech about the nature of the British people (‘they called us a nation of gardeners … what works in other countries won’t work here’) and make it sound both honest and just a little pompous; Newton plays Frank with an edge of humor that takes the wind out of some of his more portentous pronouncements on the state of the nation. But when called upon to give his son advice, or to put his arm about his wife, Frank becomes one of the most human figures in the entire film. I never thought I’d get choked up at a man simply putting his arm around his wife’s shoulders, but I did. Celia Johnson’s Ethel is the other side of the coin. She seems almost hardened by life, at times unforgiving to her children and a bit of taskmaster to her husband. But again, Johnson surprises. In one of the opening sequences, she protests loudly at Frank’s interruption of their house decorating to ‘take a good look at her face’. While he laughingly praises her (‘it’s not a bad face. Not as young as when I married you, but all things being equal, I wouldn’t change it.’), she wrestles with him, telling him that ‘this isn’t the time for fooling around’. But when he kisses her, she responds in a small movement: raising her hands and letting them rest on his side, before they’re interrupted by the arrival of their neighbor. The gesture is very slight, almost unnoticeable, but it is a good representation of Ethel’s character: hard, no-nonsense on the outside, but with an underlying human sensitivity that would almost go unnoticed. Johnson has the most difficult role in the film. Ethel could come off as a hard woman; she’s largely unresponsive to her husband’s sensitivity, and her coldness when her daughter runs away feels unfair, particularly now. But beneath the hardness is a sensitive character forced by social and cultural circumstances to be tough. This is a woman who has raised three children while her husband was away at war; who has seen women around her lose their sons, their husbands and their fathers. Her anger with Queenie feels extreme, but justified. Queenie has basically rejected her family’s entire system of life and it is the mother, not the father, who recognizes and responds to it. Johnson’s greatest work is done with her eyes. Unable to show overt emotions, all of the character’s suffering, happiness and love comes through in her eyes. It’s a fantastic performance, one difficult to quantify. Johnson bursts into tears once, but it is a poignant moment, all the more so because she has been so strong and unforgiving . This Happy Breed was released in 1944, at the height of the war. Newton, a sailor, had to have a special leave from the mine sweeper he served on in order to make the picture (Incidentally, the film probably saved his life. The sweeper was attacked during production and a number of the sailors killed). Allied success was far from assured. So while the film feels propagandist, it is an excellent piece of propaganda. The uncertainty of wartime comes through in every frame, but so does the hope. If Britain was going to win, it would be because of their spirit as much as their martial prowess. For all its problems, This Happy Breed reminds us of the dangers these people faced, of how brave you had to be in order to live normally. It’s a celebration of the people, not the government or the battles. It’s so damn powerful, because nothing was certain, except that you simply could not give in.